We’ve written from time to time about the fact that alternative investments like hedge funds and private equity funds don’t live up to their marketing hype. For instance, hedge funds claim they deserve their outsized investment fees because they deliver “alpha,” meaning manager outperformance. In reality, it has long been known that at most what they really provide is “synthetic beta,” which is a return profile that investors find attractive because it is not strongly correlated with that of other investments, and therefore lowers portfolio risk. In reality, that “synthetic beta” is typical of the defective airbags all too regularly sold in finance: they fail when you most need them to work, which is in badly spooked markets. Yet the marketing spin of wonky hedge funds touting intimidatingly complex strategies and slick private equity fund professionals with their cherry-picked success stories remain all too appealing to investors hungry for returns. And the most credulous and desperate are public pension funds, although many endowments and foundations and high net worth individuals are not far behind. FT Alphaville has a devastating update on this front from Nomura along with other research findings. 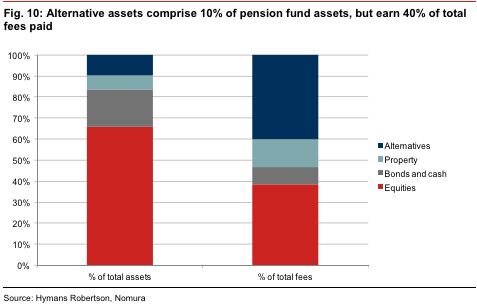 Nomura looked both at funds of hedge fund performance as well as that of the results of the underlying hedge funds and private equity funds. Fund of funds add another layer of fees, typically a 1% management fee and a 10% upside fee on top of the underlying hedge fund fees. * And before you point out the obvious, that it’s nuts to pay that much in fees, remember that Wall Street’s business model has long been based on preying on customers’ magical thinking. For instance, a short paper published in the early 1980s by Robert Vishny, Josef Lakonishok, and Andrei Schleifer** discussed with some puzzlement that the asset management industry delivered negative value, meaning it was extractive. They seemed perversely optimistic that investors would over time realize that fact and the industry would shrink. In our view, alternative assets as a group show consistently poor performance. Beta is high. Alpha is near zero, if not negative. Correlation with standard asset classes is high. Return and diversification benefits are negligible. Specifically, hedge fund alpha has been negative since 2008 even as hedge fund performance has come to mirror that of stocks even more than before. Other research is similarly devastating. One study concluded that investing in hedge funds produced from 1980 to 2008 produced only the same returns as investing in Treasuries, meaning investing in stocks would clearly beat that handily. If you want to invest in something that confers bragging rights and lousy returns, movie deals might be a better fit. One reason that returns are so poor is that 2/3 of hedge funds fail. To a large extent, private equity promoters are aware that there is some kind of performance problem in their industry. For this reason, marketing documents that we have seen describe the returns investors can achieve in private equity by referring to return data from the top quartile of private equity managers. This is done because the returns from a sample that included all private equity managers would not look impressive. For the statistically-minded, this practice is a whopper. First, how can anyone claim to represent an investment opportunity by ignoring the lower 75% of the sample data? Second, there is an implicit presumption on the part of the promoter that they will be in the top 25% in the future. This practice is not only presumptuous, but also contrary to the results of a whole literature on the empirical analysis of fund manager returns. Many NC reader tend to be dismissive of the way that investors get fleeced by hedge fund and private equity fund managers, based on some basic misconceptions. The first is that the investors are sophisticated and can take care of themselves. Second, and far more important is that what happens to these chumps is of no concern to most people. That couldn’t be more wrong, since public pension funds are the biggest group of private equity limited partners and are also significant hedge fund players. When investments come up earning less than they could due to managers ripping out too many fees, it’s the public that suffers when state and local authorities have to find ways to fill pension shortfalls. Like pension systems everywhere, New York City’s has been strained by a growing retiree population that is living longer, global market conditions and other factors. Last year, Morningstar, the investment research firm, evaluated for the first time the strength of state and local pension systems across the country and rated New York City’s as poor…. At the same time, New York has been aggressively chasing higher investment returns, shifting more money into riskier assets, which come with higher fees. Even as the system’s returns have lagged, pension officials have resisted making changes in the oversight structure that many experts believe could lead to improvements. Despite state laws calling for regular audits of the city pension system, there has not been one since 2003. Now Benjamin M. Lawsky, the state’s financial services superintendent, appears to be making up for lost time. In November, he subpoenaed about 20 companies that help pension trustees decide how to invest the billions under their control. New York’s pension system is also the only major governmental system in the country to outsource virtually all of its investment decisions to outside money managers, pension experts said. That inevitably leads to higher investment fees. In 1997, the city’s biggest fund, the New York City Employees’ Retirement System, known as Nycers, spent $17.3 million in investment fees for a $31.7 billion portfolio. By 2010, it was spending $175 million for a $35.4 billion portfolio. Some have argued the pension system would perform better if it hired its own professionals to manage the money in-house. Fees would drop, and the overall strategy would be more coherent, they contend. Not only do some large pension funds run their own in-house index funds, but seven pension funds in Canada have started doing private equity directly, cutting out the costly middlemen, and they’ve beaten industry averages after fees. So much for the necessity of paying top dollar for all that “talent”. The fact that highly respected investors like CalPERS and Harvard are cutting private equity allocations, and widely-read publications like FT Alphaville are openly derisive about alternative investment returns is a promising sign that investors are starting to question the bogus premises of investing in high-fee investment products. Simple prudence and self-preservation should reduce outsized commitments to these vendors. ** I have searched repeatedly for this Brookings paper and have been unable to find it, but it got quite a bit of attention at McKinsey back then. This entry was posted in Hedge funds, Investment management, Private equity on August 4, 2014 by Yves Smith. But “hedge funds” is not an asset class. There is a huge lemon problem in that managers CAN extract fees. I have deep insight into the area (ok, it’s an unsubstantiated claim, big deal, but it’s true whether or not anyone believes it) and have strong evidence that there do exist managers who can deliver alpha to investors. Many such managers are not open to new investment. Others are hard to identify. But if you can get the investors to mistake bull market for brains, the upside is tremendous. Thus there are many managers trying to get paid for alpha when all they can deliver is return-free risk. There are good investments but the search and information costs are large. Please go talk to pension fund consultants. They have designated hedge funds to be an asset class, and typically require diversification among various hedge fund strategies (such as market neutral, absolute return, distressed debt, event driven, global macro). The designation of hedge funds as an asset class by gatekeepers virtually forces investors who use said gatekeepers into making an allocation to hedge funds, since various academic studies (of course using much simpler categories) have found that diversifying among more asset classes reduced risk. Thanks, but your paper isn’t it. The one I saw was a very short paper, maybe 3-4 pages, published in the early 1980s. I read it when at McKinsey and it had been out at least a year or two then. I left the firm in 1986. While I agree with just about every point that has been brought up, I still don’t find it that damning. Yes, “hedge funds” which don’t actually do much hedging of their portfolios often flame out. Aggressive strategies are dangerous, and there is an obvious principal-agent problem with this sort of fee structure. Vice versa, actually hedged portfolios should be expected to under perform the market we’ve seen over the past several years. To my reading, that suggests that the more responsible any of these firms have been since 2009, the more likely they are to have folded as investors chase strategies that most recently generating returns rather than actually protecting their capital. So, fine, hedge funds fail writ large to generate alpha in an extraordinarily bullish market. I’m more concerned with how they would perform during corrections and outright crashes, to which they (one would hope) should be optimized to react. That even apparently well hedged portfolios fail so often in these scenarios- that previously uncorrelated assets begin acting in unison, or that the improbabilities of actual market conditions exceed designers’ models (a la LTCM). This is really the fatal flaw in overconfidence in any potential portfolio design, not just HFs. More generally, though, I am confused by a line of reasoning that seems to undergird many of the pieces critical of hedge funds and active investors in general- that active trading/management as a strategy never prospers. Obviously it would be the minority who do well, if for no other reason than transaction costs, but a persistent minority nonetheless. At once there seems to widespread acceptance of at least a weak EMH, yet a rejection of the obverse point that for every loser in a (near) zero sum transaction that there should be a winner as well. I’m all for attacking undue privilege, disproportionate political influence, and unearned fees in this sector, but it’s difficult for me to believe that there was no advantage whatsoever to investing in the bulk of these funds. I would really like to see any academic efforts that have been directed to simulating funds’ (of known composition/strategy) returns if we had encountered greater volatility over the past four years, which I think many HF investors quite reasonably anticipated. If anyone has any examples of that sort of research or gaps in my reasoning, input is appreciated. Thanks as always to our host. Wow, did you actually read the piece? It stated that hedge funds produced only Treasury-level returns from 1980 to 2008. A separate analysis showed that hedge funds delivered negative alpha since 2008. Did you ALSO miss that there’s no persistence of outperformance in hedge funds, and no longer any in PE? So pray tell how someone finds the fund that happens to outperform in a particular year. And even if you got it right one year, the absence of persistence means you’ll be wrong next year. Rather than question the logic of investing in private equity at all, everyone in the industry has convinced themselves that it is reasonable to believe that they can be the Warren Buffett of private equity. The investment consultants go through the shooting-fish-in-a-barrel exercise of convincing their institutional clients that each of them is prettier, smarter, and more charming than average, and therefore capable of achieving sparking results. Needless to say, flattery is an easy sell. This dynamic is similar to another practice we’ve discussed regularly, namely, how CEO pay is set. Compensation consultants tell public company boards that all of them deserve above-average CEOs who must be paid above-average wages compared to their public company peers, thereby fueling ever-escalating CEO pay. Fundamentally, this is an intellectually dishonest exercise, and diametrically opposed to the way many public pension funds construct other parts of their investment portfolios. With public equity in particular, it’s almost certain that a significant majority of U.S. pension fund assets are invested in index funds. That’s because pension funds have recognized that, collectively, they cannot do better than average, and that after paying active management fees, actively managed public equity portfolios typically perform worse than the market average. Yes. Maybe my points weren’t very clear. I do not disagree that HFs as a cohort fail to justify egregious fees with comparable performance in all environments. I do not believe that, examined as a category, HFs should be attractive to anyone. I also get that the actual dollar weighted returns by endowment X that jumped into, say, OZ Master Fund are likely to be derisory compared to the publicized rates because their years of stellar performance were when they were young and small enough to be agile. However, I’m concerned that we’re edging close to an inversion of the Lake Woebegon fallacy- that because the category does poorly, we can make universal statements about all participants. We cannot say from Dichev and Yu that there are no HFs generating impressive returns. Bridgewater, Blackrock, Elliot, Baupost…they’ve done pretty well. This does no nothing to assure that any given potential HF investor will have any luck in picking the next stellar performer, but it does suggest that consistent performance over longer time periods isn’t an impossibility. Question about your opinion on hedge fund/PE investing vis-a-vis public pension funds. It’s always been my understanding that pensions operate under a “defined benefit” schedule, in that every body under the plan knows how much they are going to get and at what intervals, and also how much they pay in, and at what intervals, and therefore the managers know their return targets pretty closely, because the sheer number and variety in participants makes sure the fund never has to cash out come crisis-time. With this in mind, why does it matter what kind of performance hedge funds deliver, if the manager pays out the plans in the end? In fact, if you were the fund manager, wouldn’t you be willing to pay a higher premium for a less volatile investment? You have very highly paid, very sophisticated investors running these multi-billion dollar funds, so presumably they aren’t getting bilked. And as long as Average Joe gets his defined benefit check in the mail, what does he really care? One of my close family members falls squarely into the latter camp. He gets a check for $X every month. As long as that check keeps coming, whether the fund manager is taking 1 and 10 or 3 and 50, or if the pension fund is partnering with vanguard, which takes 25 bps, is irrelevant to him. Case in point is the NYCERS example in the article. The quote is that the fund paid out very roughly 2% in total fees. Regardless of if an independent manager “could have” generated superior returns, at the end of the day, isn’t the cash flow the the pensioners the primary concern? If the fund is generating the target returns at the target volatility, what does it matter? Legalize Insider Trading For Common Man. Earning less than the market offers on a sensible investment mix is indeed a tragedy for the beneficiaries. High fees are one way public injury occurs. Choosing a poor investment mix is another. Social Security, the largest pension asset for a big chunk of the U.S. population, doesn’t hold any equities, despite an ‘equity premium’ being a staple of financial theory since the 1960s. Social Security’s near-zero real returns are the single largest contributor to the pauperization of the middle class. Under a stable monetary system, a prudent investment mix would mainly consist of selecting the split between equities and bonds. When the poison of inflation is introduced via fiat currency (post-1913, in the U.S.), real assets (often with zero expected real return) must be introduced as a third asset class to hedge bonds against erosion of their purchasing power. With the introduction of fully-collateralized commodity funds during the past decade, publicly traded vehicles are available for any fiduciary to hold a sensible asset mix with very low fees. With its current 0.0945% net expense ratio, SPY (the oldest and largest ETF) will trounce all but a few private equity outliers over periods of a decade or more. Could we conclude that hedge funds are basically portfolios of synthetic options? A portfolio of options can do fantastically well over a short run, but in the longer run time-decay plus fees will drag performance down, hence the high failure rate. When I look at an option that is quoted say 0.50-0.75, I think to myself, ‘Wow, if they buy at the bid and sell at the ask they have made +50%!’ It’s the market makers who are making a killing. Maybe hedge funds should be a short-term trading allocation rather than a long-term asset allocation; but they are not really structured for that!